12 bloggers, and 12 amazing vegan desserts that will rock your world. Honestly, you’ll be drooling after seeing this list!! So, I challenged a group of bloggers to come up with there own vegan dessert recipe. And I am super proud of my fellow collaborators!! They did such an awesome job and there isn’t a single recipe on this list that I wouldn’t stuff my face with. And what I really got pumped about is that none of these dished look like a “vegan dessert”. Every dessert on that list is just a recipe that looks amazing regardless of whether it’s vegan or not. And that is what this collaboration is all about. I am not some kind of vegan activist or even a vegan for that matter, I am a vegetarian. I just wanted to show that vegan baking is possible and that you don’t need to shy away from it. And I knew I was going to be happy with these recipes because every blogger who collaborated is super talented and definitely worth checking out. They put the hard work into these recipes and as you can see, it totally paid off. 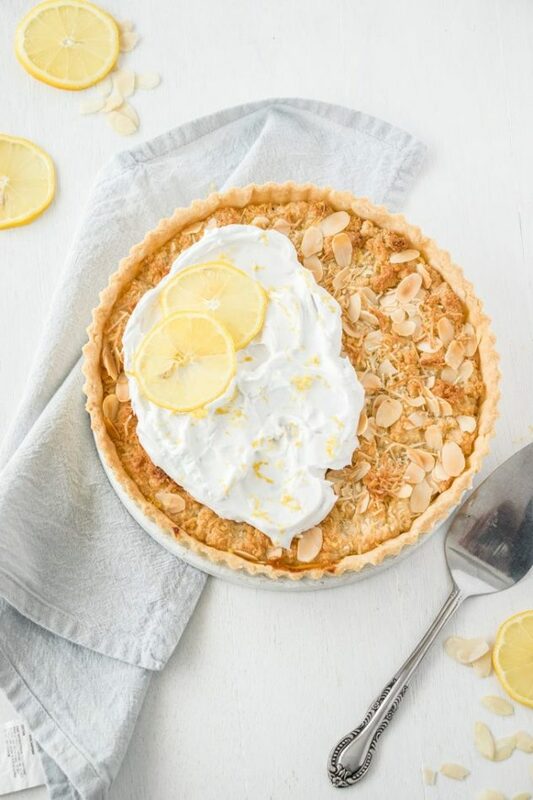 Vegan Lemon Coconut Frangipane Tart – Frangipane, lemon curd, sweet pastry and whipped cream…yep it’s all vegan, and I dare you to tell me it doesn’t look amazing! The deep nuttiness with the tangy lemon sounds like an absolute winning combo! Great job Marie! 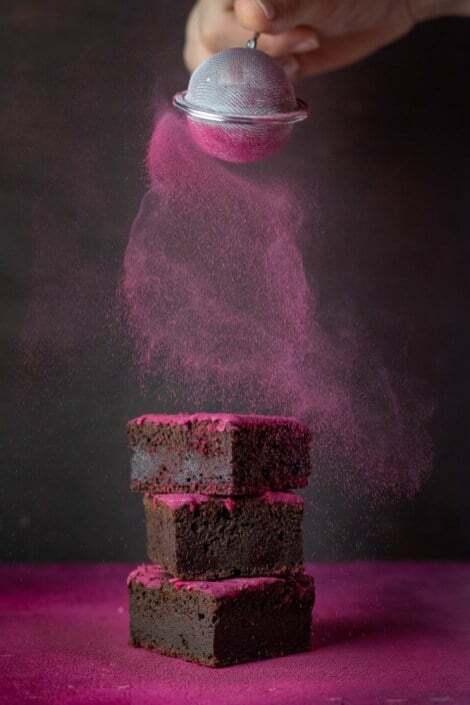 Chocolate Beetroot Brownies – Honestly, I see so many recipes with the title “best brownies ever” or something around those lines, and 99% of the time it’s the same old thing. Reka, on the other hand, has a talent for taking a well-known recipe and transforming it into something epic!! And she never really needs to talk or write about how good the recipe is because well, the content speaks for itself. 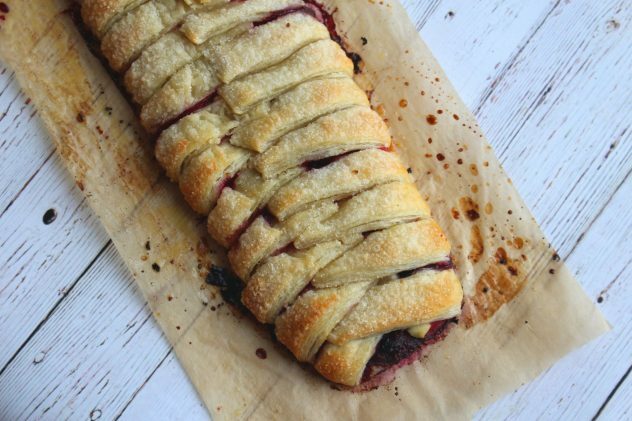 Berry Brie Vegan Strudel – I was pumped to see that this list has a recipe that involves vegan puff pastry. And a strudel that is presented so much more nicely than the one I learned to make. That flaky pastry with the berries and brie…mmm. Vegan Chocolate Caramel Tart – So, you look at this amazing chocolate tart and see how awesome it is, and you think that’s all there is to it because it doesn’t get much better than that. Until you cut through the middle only to find out that the tart also has an amazing caramel filling. 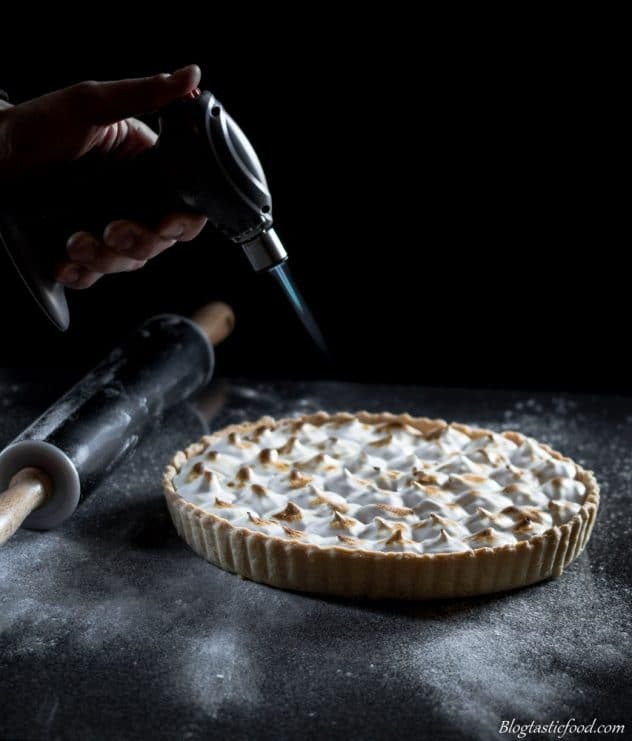 You’ll be shocked to see how this tart is made by the way, go check it out! 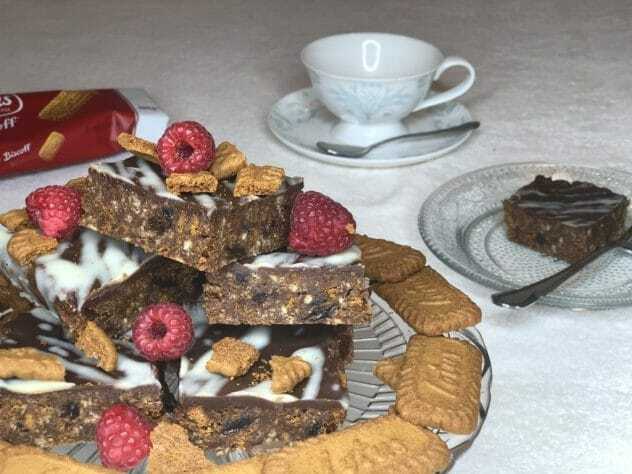 Vegan Biscoff Tiffin – A fitness blogger who gladly accepted my invitation into the foodie world to make this amazing tiffin. I had absolutely no idea what a tiffin was, and you may not know what it is either, until now. Go check out her post and then make these with a cup of tea or coffee. This is cheat day food at it’s finest Jazz! 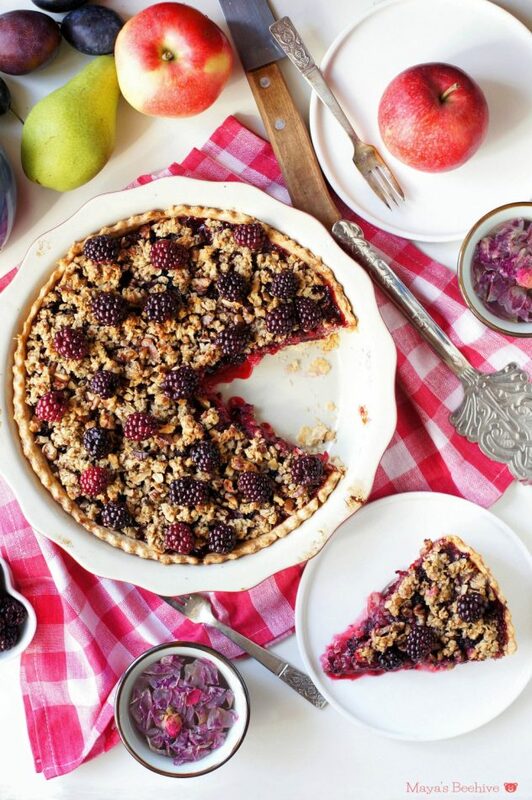 Blackberry Pie with Walnut Cardamon Crumble – A beautiful comforting pie that screams “eat me”. Topped with an oaty, nutty, sweet crumble that has cardamom in it which I thought was a brilliant idea! Adding that touch is of spice is always a great way to add that little extra oomph to the dish. 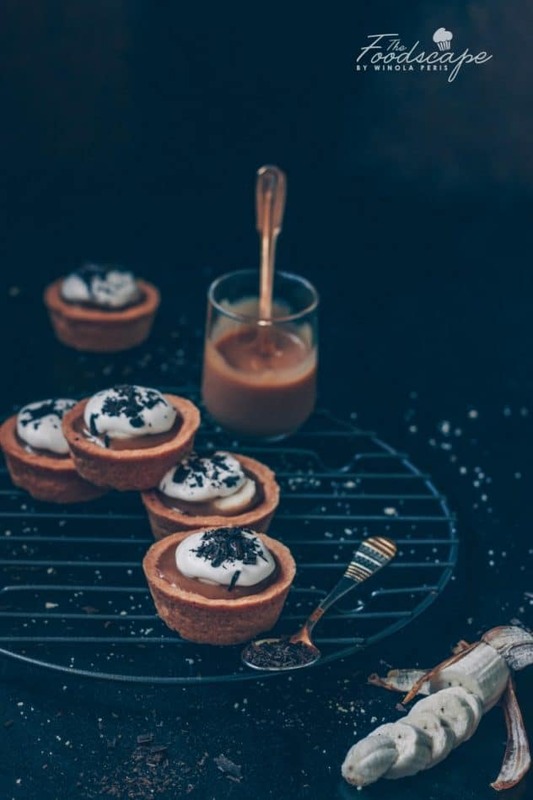 Vegan Banoffee Pies – Now c’mon, how can you not even get excited about this. Banana, toffee sauce and coconut cream loaded in a tart shell. I could just devour every last one of those little pies. Winola, you’ve done vegans proud! 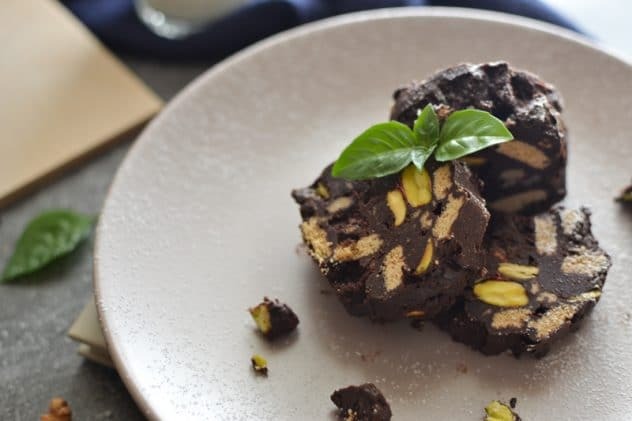 No-Bake Vegan Chocolate Salami – I could just pick at these all day. This chocolate salami recipe looks perfect for when you want to make something for guests. Since they require little effort but will still make you look like a superstar. This is like rocky road with finesse. 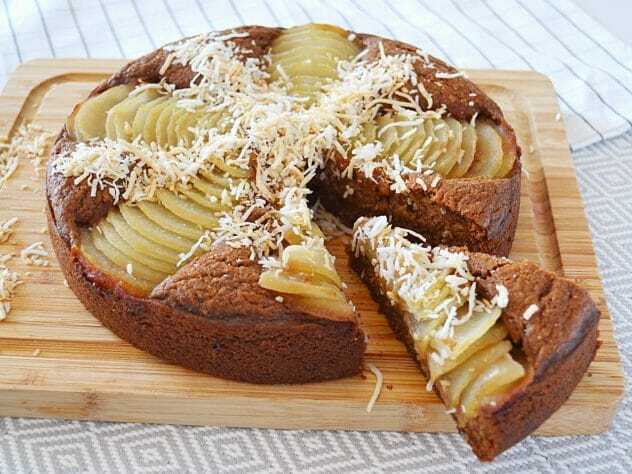 Vegan Ginger Coconut Pear Cake – I have no words. Ally is an exceptional baker, which is why I invited her to take on this challenge. Coconut ginger cake and poached pairs. Ally has managed to merge those 2 beauties together to make one incredible dessert. 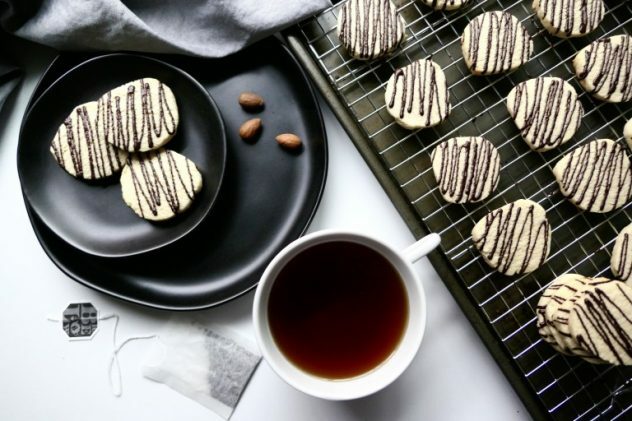 Vegan Shortbread Cookies – These biscuits look absolutely perfect!! If I had a jar of these in my house, I don’t think I’d be able to resist them. So happy that this is on the list, way to go Sarah!! 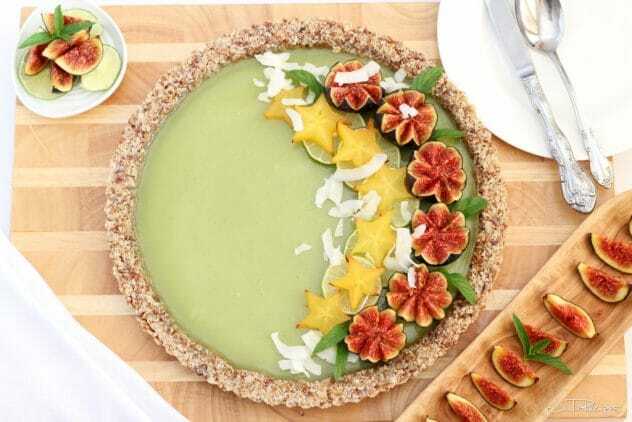 Coconut-Lime Vegan Tart – The colours, the presentation, I just want to dive right in!! Nothing beats a citrusy sweet tart. And I love the way Julia made the base too, just stunning! 12. Vegan Lemon Meringue Pie by me! Just in case you missed it, this is the dessert that inspired me to do this wonderful collaboration. I was just stunned by how a lemon meringue pie can be made so similar in a vegan form. So I thought to myself “why not see what other bloggers can do?” So I am super happy I decided to go through with this collaboration. And there you have it. I really hope you like this list, or I hope it at least opened up your mind a little bit. I really appreciate you taking the time to check out this post, and if you want to subscribe to stay updated, please feel free to do so. Wow! All of these look incredibly good!! I would want to work my way through all of these, but especially that chocolate caramel tart!! Wow! I am blown away by the variety and creativity! What a successful project! Thank you, again, for bringing us all together for this. Wow! These all look so amazing – I must try out these recipes asap! Haha my pleasure Teresa! Everyone loves your chocolate tarte! I am not a vegan, but I would happily eat these desserts, vegan or not. So many delicious options to choose from. You’re exactly right: scrolling through the drop-dead-gorgeous photos here, you don’t think that these desserts must be healthy, or must be vegan … you just think “Wow! Get in my belly!” This is a beautiful compilation, full of inspiration and recipes that need to be made ASAP! Definitely sharing this one! This is an epic round up!!! I’m not vegan but I’d love to give some of these gorgeous recipes a try!! I wasn’t sure if I was scrolling through recipe links or an art show! Wonderful selection – they look good enough to even tempt an omnivore like myself! They are all amazing! I wouldn’t know which one to pick first, and also the photography is so well done on each one of them. 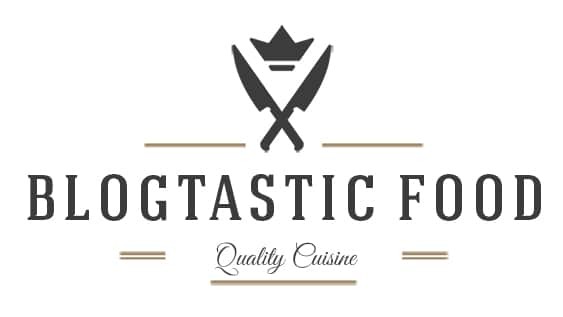 Great collaboration and assortment of recipes. Pinned! What a gorgeous collection! 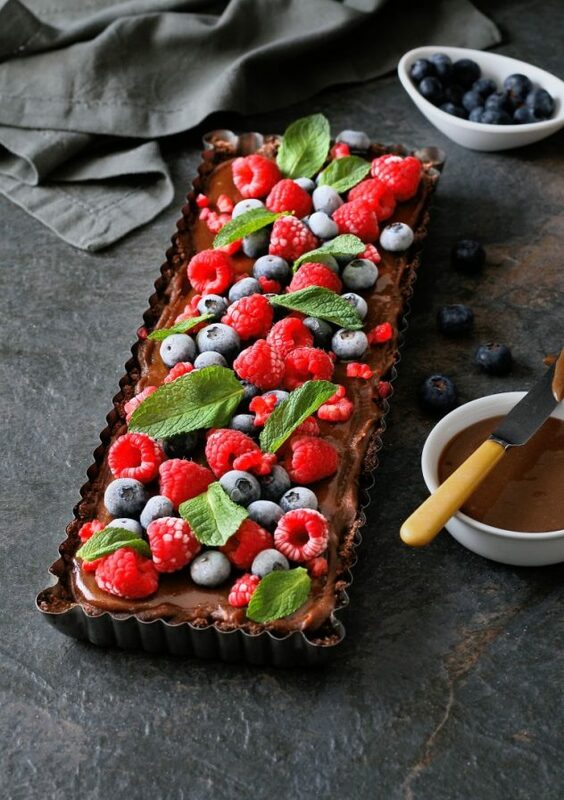 That berry tart looks especially good… but really, they all do! And I’ve always kind of enjoyed the challenge of working around ingredients you avoid – looks like they all did a great job. So happy you like them, thanks so much for the share!! Thank you so much for sharing and yes I don’t which one I would pick first either. they all look amazing! So true, I am so glad you like this Monica. Have a wonderful day!! All of these beautiful and delicious vegan desserts look so good! A great roundup for the upcoming holidays. What a great collection of vegan desserts. That chocolate caramel tart is just GORGEOUS! What an amazing collection of delicious desserts! I’ve got my eye on that chocolate caramel tart! Thank you so much Julie, I am a big fan of the chocolate tart too!! Wow! What amazing recipes! My mouth is watering – they all look wonderful. I really like the look and sound of the Berry Brie Vegan Strudel .